Abstract: Well equipped with SATA/IDE RAID, 10/100 LAN, IEEE 1394, USB 2.0, 6-channel audio, TV-out and of course nVIDIA's integrated video. When nVIDIA's original nForce chipset was announced the current AMD performance chipset leader at that time was the SiS 735 northridge. By the time nVidia had sorted out the bugs and actually made it to market with their integrated northbridge, the landscape had changed drastically and while the& nForce chipset was faster and more advanced than the SiS 735, there was a new player in town. The nForce's new competitor was the VIA KT266A chipset, and the hype brought on by dual channel DDR proved to be just that, hype. Performance of the nForce was good but it just couldn't compete with VIA's KT266A offering. As they say in the movies, that was then and this is now. NVIDA it seems have learned from their mistakes, and while the nForce2 was originally announced in July of 2002 to coincide with ATI's release of the Radeon 9700 Pro videocard, mainboards have been available to the public since around October, albeit in limited quantities. 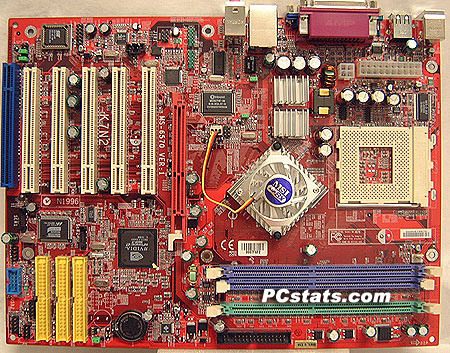 Now a days though, an nForce2 based motherboard is available from just about every single large mainboard manufacturer. In this review, we will be testing out MSI's nForce2-IGP motherboard; the K7N2G-ILSR. The MSI K7N2G-ILSR is based on the nForce2-IGP (Integrated Graphics Processor) and is teamed up the MCP2-T southbridge. Unlike the no frills K7N2-L the K7N2G-ILSR is very well equipped with serial ATA/IDE RAID, a 10/100 LAN RJ45 jack, IEEE 1394, USB 2.0, 6-channel audio, TV-out (RCA composit and S-video) and of course nVIDIA's integrated video. With all that on board it may seem pretty unlikely that you would actually need to add single expansion card to this board, but with five free PCI slots and an ACR (the blue one) you have plenty of room at your disposal. If the nForce2's integrated video isn't powerful enough for your applications there is also an 8X AGP port which from our own experience works really well with an ATI Radeon 9700 Pro video card... just don't tell Nvidia we said so. Thee 184-pin DDR DIMM slots are set up to accept up to a maximum of 3GB of PC1600/2100/2700/3200 DDR memory. We tested with 512MB of Corsair XMS3500 DDR, and the results as you will see in a moment, are quite good.